This article is about the dynasty founded by the Sima clan. 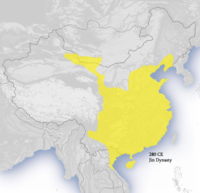 For the dynasty founded by the Wanyan clan, see Jin dynasty (1115–1234). 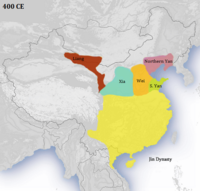 The Jin dynasty or the Jin Empire (/dʒɪn/; Chinese: 晉朝; pinyin: Jìn Cháo, sometimes distinguished as the Sima Jin (司馬晉) or Liang Jin (兩晉, "Two Jins") was a Chinese dynasty traditionally dated from 266 to 420. It was founded by Sima Yan, son of Sima Zhao, who himself was made the King of Jin and posthumously declared one of the founders of the dynasty, along with his older brother, Sima Shi, and father, Sima Yi. It followed the Three Kingdoms period (220-280 AD), which ended with the conquest of Eastern Wu by Jin, culminating in the reunification of China. Seven Sages of the Bamboo Grove, a tomb painting from Jiankang (Nanjing) now located in the Shaanxi Provincial Museum. There are two main divisions in the history of the dynasty. The Western Jin (266–316) was established as a successor state to Cao Wei after Sima Yan usurped the throne, and had its capital at Luoyang and later Chang'an (modern Xi'an); Western Jin reunited China in 280, but fairly shortly thereafter fell into a succession crisis, civil war, and suffered from the invasions instigated by the "Five Barbarians (Wu Hu)." The rebels and invaders began to establish new self-proclaimed states along the Yellow River valley in 304, inaugurating the "Sixteen Kingdoms" era. These states immediately began fighting each other and the Jin Empire, leading to the second division of the dynasty, the Eastern Jin (317–420), when Sima Rui moved the capital to Jiankang (modern Nanjing). The Eastern Jin dynasty was eventually overthrown by Liu Yu and replaced with the Liu Song in 420. The Jin dynasty was founded in AD 266 by Sima Yan, posthumously known as Emperor Wu (the "Martial Emperor of Jin"). He forced Cao Huan's abdication but permitted him to live in honor as the Prince of Chenliu and buried him with imperial ceremony. The Jin dynasty conquered Eastern Wu in 280 and united the country. The period of unity was short-lived as the state was soon weakened by corruption, political turmoil, and internal conflicts. Sima Yan's son Zhong, posthumously known as Emperor Hui (the "Benevolent Emperor of Jin"), was developmentally disabled. Conflict over his succession in 290 expanded into the devastating War of the Eight Princes. The weakened dynasty was then engulfed by the Uprising of the Five Barbarians and lost control of northern China. Large numbers of Chinese fled south from the Central Plains; among other effects, these refugees and colonizers gave Quanzhou's Jin River its name as they settled its valley in Fujian. The Jin capital Luoyang was captured by Xiongnu King Liu Cong in 311. Sima Chi, posthumously known as Emperor Huai (the "Missing Emperor of Jin"), was captured and later executed. His successor Sima Ye, posthumously known as Emperor Min (the "Suffering Emperor of Jin"), was captured at Chang'an (present-day Xi'an) in 316 and also later executed. The remnants of the Jin court fled to the south-east, reestablishing their government at Jiankang within present-day Nanjing, Jiangsu. Sima Rui, the prince of Langya (琅琊), was enthroned in 318, posthumously becoming known as Emperor Yuan (the "First Emperor of the Eastern Jin"). The rival northern states, who denied the legitimacy of his succession, sometimes referred to his state as "Langya". At first, the southerners were resistant to the new ruler from the north. The circumstances obliged the Emperors of Eastern Jin to depend on both local and refugee gentry clans, the latter convinced the former of the emperor enjoying high prestige by showing superficial respect to Rui, which was also the pinnacle of menfa politics (門閥政治), Several immigrated gentry clans were very active and they grasped the national affairs: Wang (王) clans from Langya and Taiyuan, Xie (謝) clan from Chenliu (陳留), Huan (桓) clan from Qiao Commandery (譙郡), and Yu (庾) clan from Yingchuan (潁川). The Emperors of Eastern Jin had limited power. There was a prevalent remark that "王與（司）馬，共天下 (Wang Dao and the emperor Sima Rui, they dominate the nation together)" among the people. It is said that when Emperor Yuan was holding court, he even invited Dao to sit by himself accepting jointly the congratulations from ministers, but Dao declined it. The local gentry clans were at odds with the immigrants. As such, tensions increased; they loomed larger in Jin's domestic politics. Two of the biggest local clans: Zhou (周) clan from Yixing (義興) and Shen (沈) clan from Wuxing (吳興)'s ruin was a bitter blow from which they never quite recovered. Moreover, there was a conflict among the immigrated clans' interests; it was a faction that led to a virtual balance which somewhat benefited the emperor's ruling. Although there was a stated goal of recovering the "lost northern lands", paranoia within the royal family and a constant string of disruptions to the throne caused the loss of support among many officials. Military crises—including the rebellions of the generals Wang Dun and Su Jun, but also lesser fangzhen (方鎮, "military county") revolts—plagued the Eastern Jin throughout its 104 years of existence. Special "commanderies of immigrants" and "white registers" were created for the massive amounts of Han Chinese from the north who moved to the south during the Eastern Jin dynasty. The southern Chinese aristocracy was formed from the offspring of these migrants. Celestial Masters and the nobility of northern China subdued the nobility of southern China during the Eastern Jin and Western Jin in Jiangnan in particular. The most populous region of China was southern China after the depopulation of the north and the migration of northern Chinese to southern China. Different waves of migration of aristocratic Chinese from northern China to the south at different times resulted in distinct groups of lineages, with some lineages arriving in the 300s-400s and others in the 800s-900s. The Eastern Jin recovered its unity in the face of the 383 invasion by the Former Qin. The short-lived cooperation among Huan Chong (brother of General Huan Wen) and Prime Minister Xie An helped provide a major victory at the Fei River. A large amount of Former Qin territory was then taken or retaken. Later, Huan Xuan, Huan Wen's son, usurped the throne and changed the dynasty's name to Chu. He, in turn, was toppled by Liu Yu, who reinstated Sima Dezong, posthumously known as Emperor An (the "Peaceful Emperor of Jin"). Meanwhile, as civilian administration suffered, there were further revolts led by Sun En and Lu Xun; Western Shu became an independent kingdom under Qiao Zong. Liu Yu had Sima Dezong strangled and replaced by his brother Sima Dewen, posthumously known as Emperor Gong (the "Respectful Emperor of Jin"), in 419. Sima Dewen abdicated in 420 in favor of Liu Yu, who declared himself the ruler of the Song; he was asphyxiated with a blanket the following year. In the north, Northern Liang, the last of the Sixteen Kingdoms, was conquered by the Northern Wei in 439, ushering in the Northern dynasties period. The Xianbei Northern Wei accepted the Jin refugees Sima Fei (司馬朏) and Sima Chuzhi (司馬楚之). They both married Xianbei princesses. Sima Fei's wife was named Huayang (華陽公主), who was the daughter of Emperor Xiaowen; Sima Chuzhi's son was Sima Jinlong (司馬金龍), who married a Northern Liang princess who was a daughter of Xiongnu King Juqu Mujian. Much later, Sima Guang (1019–1086), who served as prime minister to the Song, claimed descent from the Jin dynasty (specifically, Sima Fu, brother of Sima Yi). The uprising of the five barbarians led to one in eight northerners migrating to the south. These immigrants were called "qiaoren (僑人, literally the lodged people)", accounting for one sixth of the then people living in the south. Considering most property of these refugees had been lost or exhausted as they arrived, they were privileged to be free from diao (調), a special poll tax that was paid via the silk or cotton cloth in ancient China, and other services. Their registers which were bound in white papers were called baiji (白籍). The ordinary ones which were bound in yellow papers were called huangji (黃籍) in comparison. When the situation settled down, the preferential treatment not only was a heavy burden for the nation, but also aroused dissatisfaction from the natives. Hence, tu duan was an increasingly important issue for the Eastern Jin. 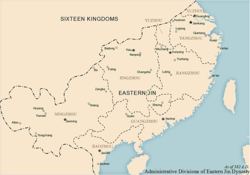 The Eastern Jin court established the lodged administrative divisions which served as strongholds of the qiaoren. More effective administration for them was a realistic starting point for that. Consisting of three levels: qiaozhou (僑州, the lodged province), qiaojun (僑郡, the lodged commandery), and qiaoxian (僑縣, the lodged county), these lodged administrative divisions were merely nominal without possessing actual domain, or rather, they were local government in exile; what could scarcely be denied was their significance in Jin's legitimacy for the northern territory as somewhat an announcement. Furthermore, it was also an action done to appease the refugees' homesickness, which was evoking their desire to resume what had been lost. The lodged Pei, Qinghe, Xiapi, Dongguang, Pingchang, Jiyin, Puyang, Guangping, Taishan, Jiyang, and Lu commanderies were established when Emperor Ming ruled. The rebellions and invasions occurring in Jianghuai area led to more refugees switching to settle in the south of the Yangtze River, where the lodged Huainan Commandery was established afterwards. However, carrying these out was more complex than the policy was formulated. Several actual counties were under the jurisdiction of the lodged commanderies. A few lodged administrative divisions are still retained in China nowadays. For instance, Dangtu County was originally located in the area of Bengbu, however, the lodged Dangtu County was established in where it is now, and the latter replaced the former, inheriting its place name. Hence, it was perhaps initially proposed by these two persons, but was only seriously implemented during the Eastern Jin and the Southern dynasties. The Jin dynasty is well known for the quality of its greenish celadon porcelain wares, which immediately followed the development of proto-celadon. Jar designs often incorporated animal, as well as Buddhist, figures. Examples of Yue ware are also known from the Jin dynasty. Celadon lian bowl with Buddhist figures, Western Jin, 265–317 CE. Taoism was polarized in the Jin dynasty. The Jin emperors repressed Taoists harshly, but also tried to exploit it, given the way it had been used near the end of the Han era in the poor peasants' revolts. Amidst the political turmoil of the era, many successful merchants, small landowners, and other moderately comfortable persons found great solace in Taoist teachings and a number of major clans and military officers also took up the faith. Ge Hong emphasized loyalty to the emperor as a Taoist virtue; he even taught that rebels could never be Taoist immortals, which made Taoism more palatable to the imperial hierarchy. As a result, popular Taoist religions were considered heterodoxy while the official schools of the court were supported, but the popular schools like Tianshi Taoism were still secretly held dear and promulgated amongst ordinary people. Disunity, disintegration, and chaos also made Buddhism more popular, in part due to the focus on addressing suffering. The Jin dynasty marked a critical era for Mahayana in China. 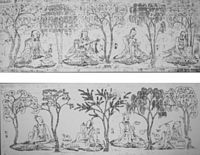 Dharmarakṣa’s translation of the Saddharmapundarika Sūtra was the most important sutra before Kumārajīva’s Lotus Sutra. It was said that there were 1,768 Buddhist temples in the Eastern Jin. Furthermore, Taoism advanced chemistry and medicine in China, whereas the contribution of Mahayana was concentrated in the philosophy and literature. ^ a b Taagepera, Rein (1979). "Size and Duration of Empires: Growth-Decline Curves, 600 B.C. to 600 A.D.". Social Science History. 3 (3/4): 128. doi:10.2307/1170959. JSTOR 1170959. ^ a b Grousset, Rene (1970). The Empire of the Steppes. Rutgers University Press. pp. 56–57. ISBN 978-0-8135-1304-1. ^ Gernet (1996), p. 182. ^ Nicolas Olivier Tackett, The Transformation Of Medieval Chinese Elites (850-1000 C.E.) p. 81. ^ John Lagerwey; Pengzhi Lü (30 October 2009). Early Chinese Religion: The Period of Division (220-589 Ad). BRILL. pp. 831–. ISBN 978-90-04-17585-3. ^ Book of Song, Vol.35. ^ Book of Jin, Vol. 36. ^ Book of Jin, Vol. 46.
de Crespigny, Rafe. "The Three Kingdoms and Western Jin: A History of China in the Third Century AD" (PDF). Archived from the original (PDF) on 13 August 2012. Retrieved 11 July 2016.